So I don’t just bake cupcakes – today I decided to venture out into fudge territory. Now I’m very specific about my fudge – I hate those sugary kinds they make me feel sugar-overload-sick. It is quite gay feeling like you have overloaded on sugar when, in fact, you’ve had barely any. I like the creamy ones that have a sweetened condensed milk base. This is my first attempt at fudge making, as I have only ever watched and eaten what my mother made. So I really don’t know what other types of fudge you can get, except for sugar based or sweetened condensed milk based. But I am sure in my experimenting I will soon find out. In my venturing out into fudge territory I found I actully don’t have any fudge recipes in the tombs of cookbooks that grace my bookshelves. So I turned to the trusted internet, which always provides something. The recipe I settled on was a peanut butter fudge – I’m a sucker for anything with peanut butter. I’m quite literally an utter peanut butter nutter. I found this little gem at Fudge Recipe Collection. They deserve all the credit for this recipe. This one is very simple to make and is very quick too! I also love it because it uses the microwave, which always makes things super easy. In a microwave-able bowl, melt the chocolate chips and peanut butter on “high” for approximately 3 minutes (time will vary according to microwave wattage). Stir well. Add the milk and continue to stir until well combined. Pour mixture into a square pan (I used a 20x20cm) which has been lined with waxed paper. Refrigerate until chilled (approximately 2 hours). Turn the fudge out onto a cutting board, then remove waxed paper. Cut into as many squares as you like (I got 36 out of my tin). When you add the sweetened condensed milk to the chocolate/peanut butter, the mixture cools quite quickly and turns very thick. So when putting into the tin, try and do as quickly as possible so spreading it to the edges is made easier. 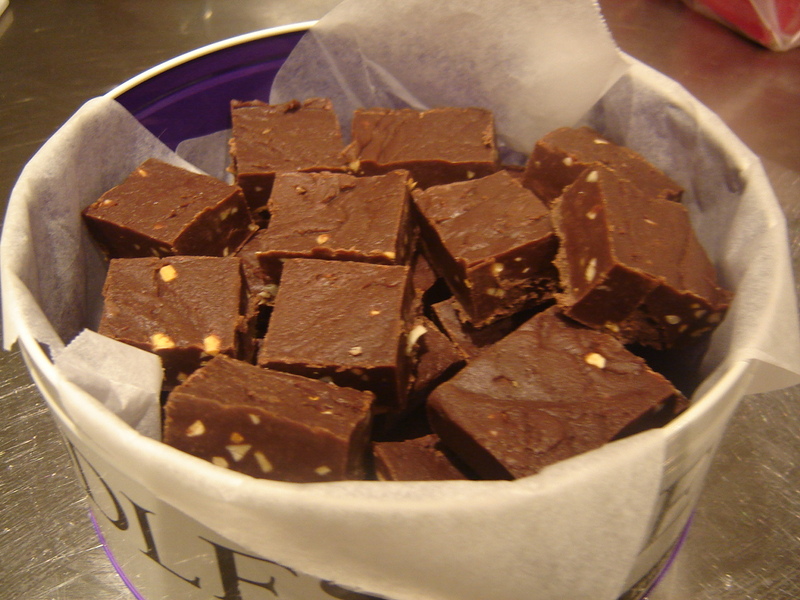 I also used crunchy peanut butter – it adds a little something extra to the fudge by having nut pieces in it. The recipe calls for 360g of peanut butter and the jar used was 375g – you would think there would be some left over, but no. So you can safely say it uses an entire jar (that is if you go for the standard size jar in NZ). With the sweetened condensed milk, it says 435ml but standard cans in NZ are 395ml. I just used one can and it hasn’t affected the outcome whatsoever, so you can cut it down to just a tin. I also find using dark chocolate when baking gives a stronger flavour, so try and use dark chocolate chips when making this. I found this recipe really easy and quick. I will definitely be making this again, if only to satisfy my choclolate addiction.